꼬치동자개는 동자개과의 한국 특산 담수어류로 우리나라 낙동강 상류의 큰 돌이 많이 깔려 있는 깨끗한 일부 수역 즉, 낙동강의 영천, 대구, 봉화, 영주, 성주, 밀양, 창령, 산청, 함양 등지에 분포하지만 최근 하천개발 및 오염으로 인하여 서식지가 줄어 들고, 개체수 또한 희소하다. 하천 상류의 물이 비교적 맑고 바닥에 큰 돌과 자갈이 많이 깔려 있는 곳에서 수서곤충의 유충을 주로 먹고 산다. 야행성으로 산란기는 6∼7월로 추정된다. 몸은 8cm이하의 소형 종으로 머리는 옆으로 약간 납작하고 몸통은 짧으며 꼬리부분은 위 아래로 납작하다. 몸에 비늘은 없고 눈은 비교적 크다. 담황색의 몸에 등지느러미와 가슴지느러미의 앞에는 강한 가시가 있고 등쪽과 옆구리에 갈색 반문이 이어진다. 최근 자연서식지가 급격히 파괴되어 멸종위기 상태여서 현재 환경부의 멸종 위기종으로 지정되어 보호·관리되고 있다. Korean Stumpy Bullhead (Pseudobagrus brevicorpus) is a freshwater fish endemic to Korea and is found in clean waters with large stones and pebbles at the bottom. Known habitats are the upstream parts of Nakdonggang River in Yeongcheon, Daegu, Bonghwa, Yeongju, Seongju, Miryang, Changnyeong, Sancheong, and Hamyang. Due to riverside development and pollution, however, it is becoming a rare species since it has not been found at all, or found only in small numbers, despite the increasing number of habitats in recent years. It mainly lives in clean upstream waters with large stones and pebbles at the bottom and feeds on the larva of aquatic insects. It lays its eggs in June-July. 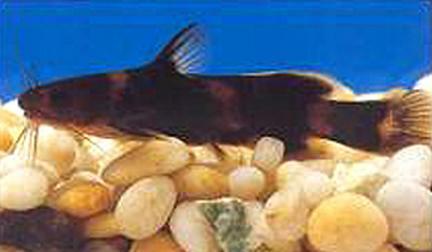 A small fish at 8cm, it has a head that is rather flat at the sides, a short body, and a flat tail. It has no scales on the body, with relatively large eyes. Pale yellow in color, it has a hard spine at the back and chest fins and brown spots on the back and sides. With the rapid destruction of its natural habitat, the Korean stumpy bullhead has been listed as an endangered species by the Ministry of Environment for its protection and management.